It has been four months, four whole months, to the day in fact, since I last posted on this little blog of mine. It’s not that I haven’t wanted to blog, I really have. But the longer I left it, the harder it got for me to write an explanation of where I have been. At the start of June, I posted on my Instagram that I’d be back any day, and I had every intention of doing so, but I just kept putting it off.. well not anymore. Grab a cuppa and get comfortable, as I have a feeling this is going to be a long one. Hello guys, it’s me, Ioanna. Where should I start? Well, I’m a wife now. We got married! Our wedding day on the 30th of April was 100% the best day of my entire life so far. The day itself couldn’t have gone any smoother. All of the months of planning every single meticulous detail paid off and I was over the moon with how it all came together. And as for how I felt? My heart was filled to bursting with all the love I felt that day. In every photograph I’m either smiling or laughing, it truly was the happiest day. I’m getting emotional just writing this but I have a lot of wedding related post ideas so I’ll leave it at that for now. Watch this space. After our unforgettable wedding day my husband and I jetted off to Thailand for a much-needed break. I enjoyed exploring Bangkok’s incredible architecture, markets and the mesmerising rooftop views and in Koh Phanghan I fell in love with the tropical surroundings, our luxurious cabin along with its private swimming pool and the delicious fruits. Leading up to the wedding I felt overwhelmed with everything I had going on. I felt like I was stuck on spin cycle and had to hit pause. Work was horrendously busy and stressful, I still had quite a bit to do for the wedding, various appointments and a honeymoon to pack for. Something had to give, and sadly it was my blog. When we got back from our honeymoon I was determined that I wouldn’t feel the post-wedding and honeymoon blues. It’s only natural really, there’s such a huge build up, time and effort, and it is all over in just ONE DAY. But I came back feeling so positive, happy, relaxed and recuperated that I just didn’t foresee that it would hit me. If you’re trying to plan a fantastic honeymoon, take a look at Jettly to see if you could hire a private jet, for that added luxury! Planning a wedding is stressful, I loved every minute, but it was stressful. So I thought I’d enjoy not having it to plan anymore. I eased myself back into normality and gave myself other things to focus on. I had a huge clear out, declutter and tidy of our flat. I gave over 10 bin bags full of clothes to charity, I tidied, rearranged and sorted every drawer and every cupboard (apart from that one kitchen cupboard left to sort). I bought a new dressing table and organised all of my make up. I bought new shelves to display some of my favourite things. I sold a whole bunch of stuff that I never use. I even cleaned the oven. It was cathartic. We had accumulated so much stuff over the three years of living in our flat, a declutter was way overdue. I’m a year older and another year closer to 30 (but it’s okay, I’m not going to think about that), I sent all of our thank you cards, read lots of books and I replaced our dinner set (FYI its marble *heart eye emoji*). I’ve covered the walls of our flat with pretty frames filled with photographs from our favourite day, I designed my own wedding photo album which saved us a fortune and we had a weekend away in Disneyland Paris acting like children on Christmas day. 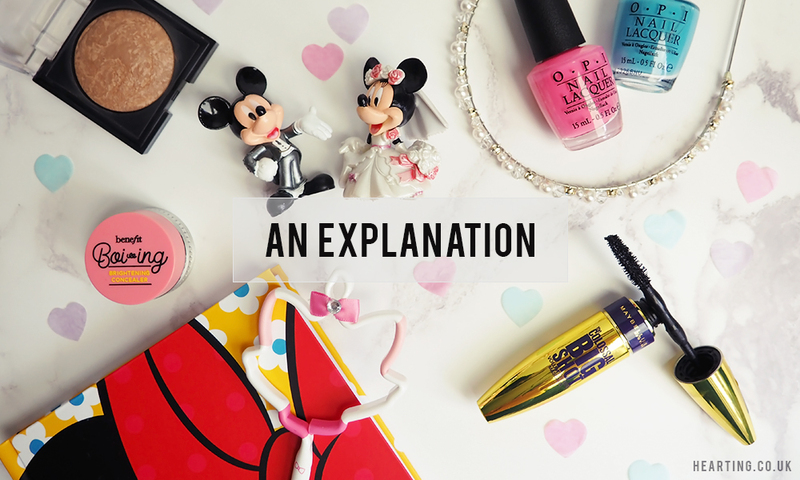 I’m still addicted to nail polish (you don’t want to know how much my nail polish stash has grown), make up and trying out every new mascara released on the high street (pretty much without fail). My love for all things Disney is growing (hoping this will feature a bit more on the blog moving forwards), I’m trying very hard to buy less stationery (but failing) and I still have a penchant for pretty things. Crunchie and Munchie joined our guinea pig family earlier this month (yep we now have eight!) and I’ve started an Instagram account (shameless plug) to share the ridiculously large number of photographs I take of them. Despite not blogging for months, our dining room table is still littered with my photography props and notebooks and my head is filled to the brim with post ideas. I’ve had this space for almost three years now and I absolutely adore my little hub of creativity. But sometimes I feel like I’m letting it down, I know what I’m capable of, but with a full-time job, various commitments and wanting to have a bit of a life, there’s not all that much time left to dedicate to my blog and make it everything that I know it can be. My lack of blogging along with a smidgen of the post-wedding blues has been getting me down, I’ve felt restless and uninspired. I’ve decided that it’s time to stop dwelling on everything I can’t do and focus on everything I can do. I want to blog. Blogging makes me happy. It helps me express myself and it is as simple as that. I’m not going to promise that I’ll post daily because that isn’t realistic but I’m going to work on it as best I can, without putting any added pressure on myself. Today marks the start of a new blogging beginning. There will be no comparing or negative thinking, I CAN do this and I hope you come along for the ride.